Some days have passed since last J2ME tutorial, so here is a fresh new one! Today we’ll see how parsing a RSS feed with J2me is easy using KXML library, a fast and small XML pull parser, expecially suited for constrained environments like mobile devices. A live sample, parsing the RSS feed of this blog, is available here. and the parse() method will return the complete list of parsed Items, as instances of RssItem class. Source code is of course simplified, for the purpose of this tutorial, as it only considers title, link and description tags of each <item>, but once you understand KXml logic you can extend it, without much effort, to include other infos from RSS feed. Hi i m a trainer in my comp, i saw the code its very nice n the standards are maintained i this coding. Currently i m working on xml parsing, so i juz want to know that if i want to display the names(channel names) in a list view on device, then is this the same procedure i need to follow or else there is a diferent way. If so can u plz tell me? the approach and code described in this post works only to parse (and display) RSS feed items, but you can easily adapt it to parse channel names, or any other infos contained within the RSS feed. I m working on a J2me Project.I ve succesfully implemented Client Login system and am able to get the RSS feed of ContactsI used ur example to parse the RSS feed.. I want to fetch all the contact names/email ids/photo and display them on screen. The problem is in parsing image and especially email address.. I want to parse out the address from the above line for all contacts.By the way I use KXML library for parsing in j2me..
Well i am trying to make this but i having one problem . when i am declaring object f KXmlPArser() its showning me error..
at this particlauar line i am gettign the error. i urgently need help on this .. I had added classpath also. 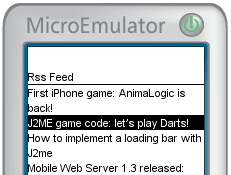 ← First iPhone game: AnimaLogic is back!